Walk ten steps past the pool and you're on the beach. Sit back by the pool and let the sun and ocean breeze do the rest. Games, arts and crafts, and a kids club are great fun on a rainy day. The poolside BBQ area is ideal for a family cookout. You're just steps from the shore. Relax on the peaceful, uncrowded beach or have a soak in the hot tub. 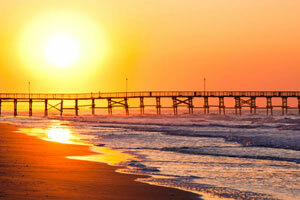 Main Street, North Myrtle Beach is just a short walk away. The beachfront Peppertree Ocean Club is located in North Myrtle Beach, has everything you need for a peaceful and quiet vacation and yet is just a quick drive to the best attractions in the area. Get everyone changed into swimsuits and slathered in sunblock before heading to the outdoor pools; you have two to choose from. Lounge with a refreshing drink or snack from the seasonal poolside snack bar. On a rainy day, you can always swim in the indoor pool or soak in the hot tubs. Thinking burgers for lunch? If the weather is cooperating, take advantage of the bbq grills and have a family cookout. Recruit the kids to help carry condiments and sides. Get your game face on and challenge the kids to a friendly competition on the basketball, tennis or volleyball courts. Air conditioned studio, one- and two-bedroom condos sleep four to six guests. Full kitchens allow you to save money by making your own meals. Bring the kids along to Food Lion to stock up on groceries. When you return to your condo, whip up a batch of your famous cupcakes and let the little ones assist with the frosting. (You’ll be thankful for the on-site laundry facility once you’re done baking – trust me.) Enjoy the cupcakes while you watch a movie; the cable TV has a DVD player. Be sure to pack favorite movies from home. Pop some popcorn, gather everyone on the couch and get ready for a fun family movie night. Shopaholics, rejoice! Barefoot Landing and Broadway at the Beach are both within a half hour of the resort and offer shopping and dining. Barefoot Landing is where you will find unique silver jewelry at A Silver Shack. Get in the Christmas spirit all year long at Christmas Mouse. Barefoot General Store has Myrtle Beach souvenirs. Cariloha features apparel made out of bamboo. Dining options include House of Blues, Johnny Rockets and Ultimate California Pizza. Broadway at the Beach is home to The Mole Hole featuring collectibles and gifts. Treat yourself to a new pair of shades at Sunglass Hut. Surprise the kids with a visit to Build-a-Bear or Toys & Co. Hungry? Señor Frogs, Hard Rock Cafe and Jimmy Buffet’s Margaritaville are just a few of your options. Little ones will have a blast at The Children’s Museum of South Carolina. Interactive exhibits include the South Carolina Fossil House where they can pretend to be paleontologists, Water Works where they’ll play with water and (bonus!) learn about the Scientific Method. The Big Bank will help them learn about money while they pretend to be a bank teller. They can pretend to be a weather person or newscaster at The Weather Center and Continuous News Desk. They’ll have so much fun that they won’t even realize they’re learning! - The front desk is open daily from 8:00 AM - 11:00 PM. If arriving after hours guests should contact the hotel at least 72 hours prior to arrival. Staff will assist with checking in to the resort after 10:00 PM during the peak season, and 8:00 PM in the off season. Guests can contact the office using the number on the reservation confirmation received after booking.